Courtesy of General Interactive Co. 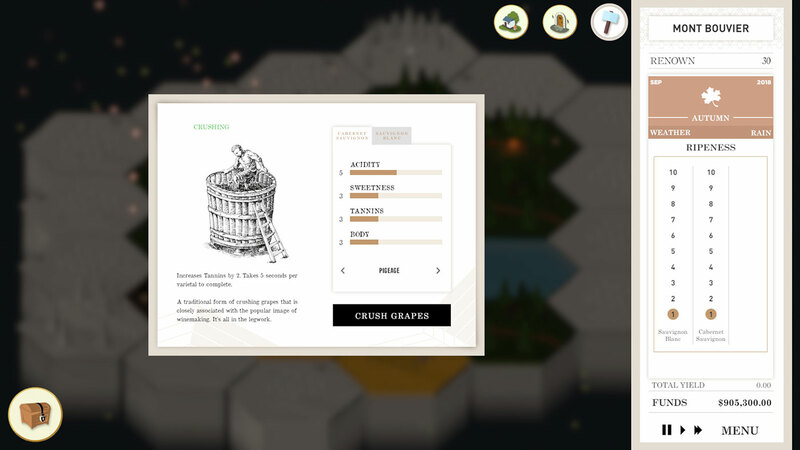 The "tycoon"-style game where players grow grapes and craft wine even caught the attention of some people in the industry. Have you ever dreamed of running your own vineyard? Would you prefer to do so from the comfort of your computer? For a mere $14.99, you too can be a winemaking tycoon—albeit in video game form. 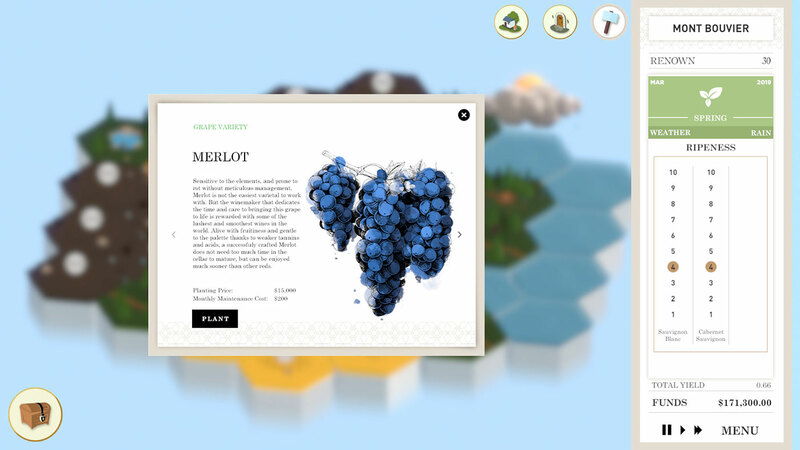 Design studio General Interactive today has released the full version of Terroir, a game that puts you in control of your own digital wine estate. This "tycoon" style of games is obviously nothing new. From lemonade stands to railroads to rollercoasters, simulation games have been made to mimic pretty much every business venture imaginable. (There's even a game called Wine Tycoon—but hey, it's not like Candy Crush invented the idea of lining up three identical items in a row!) In Terroir, players are given a tile-based interface where you can "grow a variety of different grape varietals, craft your wine, and expand and manage your Chateau, all the while dealing with the weather and events that can either make or break your business." So how did General Interactive craft the game to be like actual winemaking? "I've been a wine fanatic for the longest time, and most of the research was done by myself spending time in the library or researching the intricacies of viticulture and winemaking," Terroir's Creative Director Mark Fillon explained via email. However, that began to change once the game was released to testers. 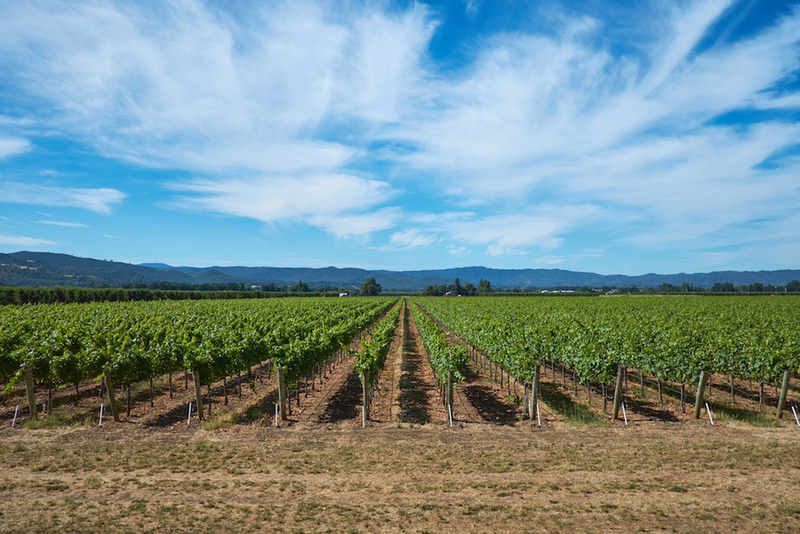 "We started getting tons of emails from people in the industry, including people working in vineyards based in Australia, Napa Valley, and Italy. They helped guide our research as the game evolved through the past few months. The wonderful (and sometimes frustrating) thing about it is that some of the people we spoke to had different opinions on some things (like the suitability of certain grape varieties to certain climates and soil types)." As far as gameplay, General Interactive says players work with multiple grape varieties "from the hardy Cabernet Sauvignon to the fragile Pinot Noir, each with their own demands," and these grapes are faced with a "dynamic weather system patterned after the Bordeaux wine region's climate." They must also learn to craft each variety of grape in its own unique way to achieve the best results. Though Fillon says the game was originally built simply for the "tycoon" crowd, the project has gotten a bit more sophisticated. "You can imagine how surprised we were that we got emails from people in the industry telling us how they enjoyed playing the game—we've even received a handful of emails from people in wine education institutes who are considering making it part of their learning sessions and classes," he said. Still, he stressed that it's primarily intended to be entertainment. "We tried our best to incorporate as much of the actual processes of winemaking into the game, but at the end of the day, we had to make sure that the game was still playable and enjoyable (some things in real life just don't translate well into game mechanics). We also had to make sure the scope of the game didn't expand beyond our capacities as game designers. Terroir is about winemaking through and through, but it is a video game above all else." First released for testing as part of Steam Early Access back in May, the game launched its 2.0 version this week. During its test run, it already garnered "mostly positive" user reviews. And the plan is for the project to continue to evolve. "We have so much more in store for the game, and we plan on continuing development on more content (and potentially even DLC content) for the foreseeable future," Fillon told The Drinks Business. "We love this game and want to bring it to life as much as we can. And hopefully, in the process, our players will enjoy it as much as we do."